Check out Trilogy's new Reflect Collection in Trilogy at Vistancia. Active adult homebuyers searching for new home designs will have plenty to choose from at Trilogy at Vistancia in Peoria, Arizona. This 55-plus community, being developed by Shea Homes, recently unveiled seven new model homes at the community’s grand opening event earlier this month. The model home gallery includes three new floor plans in the Reflect Collection, three new floor plans in the Contour Collection, and one new floor plan in the Vignette Collection. The Reflect Collection includes three new floor plans that range from 1,761 to 2,080 square feet. Priced starting in the high $200s, these floor plans feature two bedrooms, two bathrooms, and attached two-car garages. These homes also include a welcoming foyer, a multifunctional area with extra storage and counter space, gourmet kitchen, inviting living areas, a spacious great room and dining area, and covered patio. New home designs from the Contour Collection include three new floor plans that range in size from 2,046 to 2,242 square feet of living space. They have two bedrooms, two or two-and-a-half bathrooms, and attached two or three-car garages. These homes are priced starting in the high $300s and feature open layouts, contemporary kitchens with Energy Star appliances, and luxurious bathrooms. Rhythmic is the newest floor plan added to the Vignette Collection. This home is priced in the high $400s and offers 2,649 square feet of living space and has three bedrooms, three-and-a-half bathrooms, and an attached two-car garage. This spacious home features an open layout, a lounge and den, gourmet kitchen, elegant master suite, flexible living areas, spacious walk-in closet with built-in shelving, and a covered patio. This floor plan also comes with the option of converting a room into a casita or an additional one-car garage. Each home also features superb decorative interior finishes and also allows homebuyers to customize their dream home with the help of the Personal Design Studio Consultant. In addition to quality construction and design, all Shea Homes are also energy efficient. Shea Homes began construction of Trilogy at Vistancia in 2004 and plans to build a total of 5,450 single-family homes upon completion. Along with beautiful homes, this 55+ community also provides residents with resort-style amenities that support an active adult lifestyle. 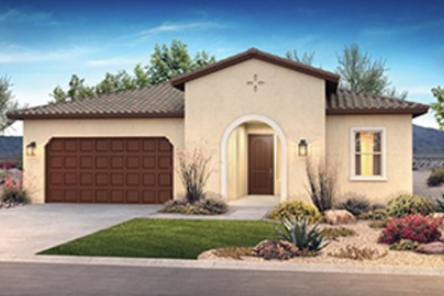 Request more information on the homes, amenities, and lifestyle at Trilogy at Vistancia!